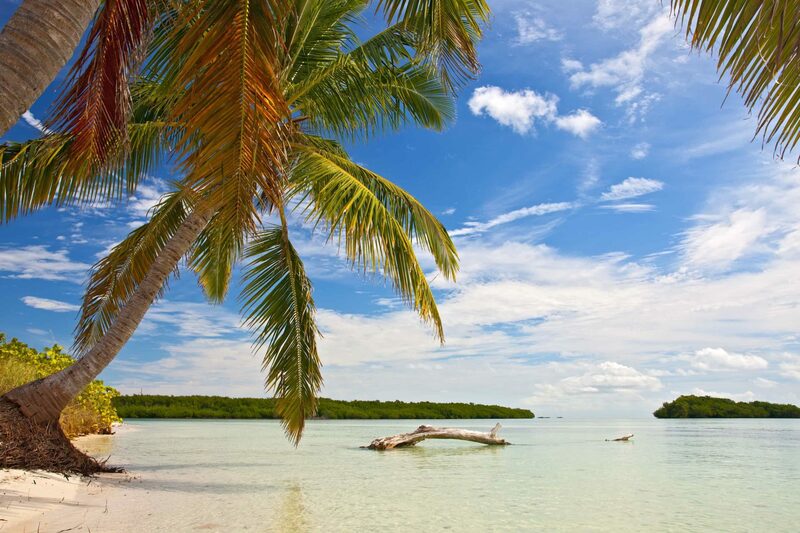 Find your bliss with our list of the best beaches on the planet for a yacht charter. There’s nothing quite like the feeling of waking up on a yacht and padding across soft carpets to look out the porthole onto a stunning beach setting. Whether it’s the waving coconut palms and sugar-white sands of the Caribbean, swimming in a breathtaking tropical bomb crater in Mexico, or living the high life in the glamorous beach clubs of Saint Tropez, the beaches you can reach on a superyacht vacation are the definition of pure beach bliss. Sunbathe among the ruins of ancient civilisations in Tulum, Yucatan Peninsula, Mexico. El Castillo beach is like nowhere else on earth. Sure, it has the requisite powdery sands and waving palms of any good tropical beach, but what makes this beach entirely special are the mighty pyramids of the ancient Mayan civilisation that rise up behind the beach and create one of the best beach backdrops on the planet. For a particularly mind-blowing way to start your day on charter, take the tender ashore in the warm pre-dawn and wander through the quiet pyramids at sunrise, before relaxing back on the beach as the Mexican sun starts to rise high in the sky. Turn the glamour quotient up high at the beach clubs of St Tropez. Pampelonne Beach is simply the place to drop anchor on the French Riviera in the summertime. Not only is this beach a generous sweep of soft golden sand that curves gently around the stunning Bay of Saint Tropez, but it’s lined with epic beach clubs such as the mega-famous Club 55, where Bridgitte Bardot once cavorted in a skimpy bikini while filming And God Created Woman— a movie that would catapult both her and the quiet fishing village of Saint Tropez to global stardom. There’s an incredible buzz on Pampelonne beach in the months of high summer, with a flotilla of superyachts anchored just offshore and celebrities and supermodels splashing about on jetskis, but if you prefer to visit in the quieter shoulder season you’ll find it still stands as one of the prettiest beach vistas of the Riviera. Swim in a beautiful bomb crater at Hidden Beach, Mexico. 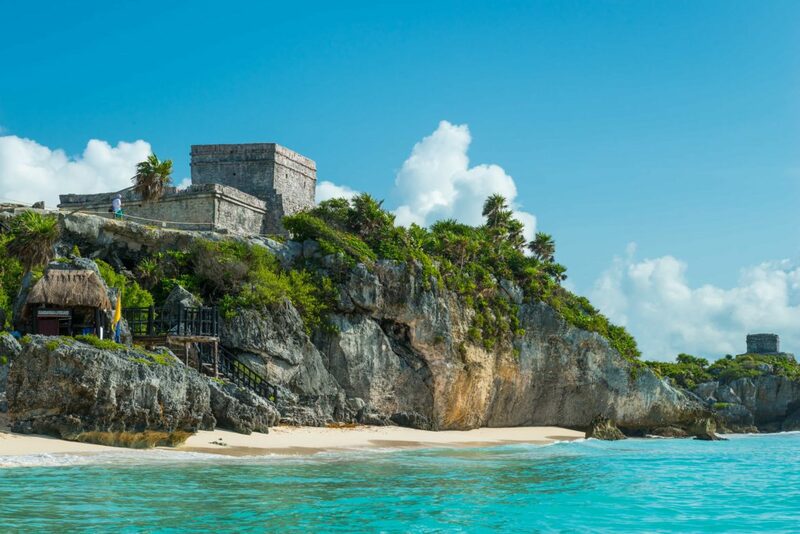 It’s back to Mexico for our next jaw-dropping beach experience. Just off Puerto Vallerta on Mexico’s Pacific Coast are the Marieta Islands: a secluded, bewitchingly pretty archipelago once used for bomb practice by the Mexican military. An explosion many decades ago created Playa Del Amore, also known as ‘Hidden Beach’: a deep crater of sapphire water and soft white sand carved out of the landscape, like a tropical cocoon set deep into the earth’s surface. 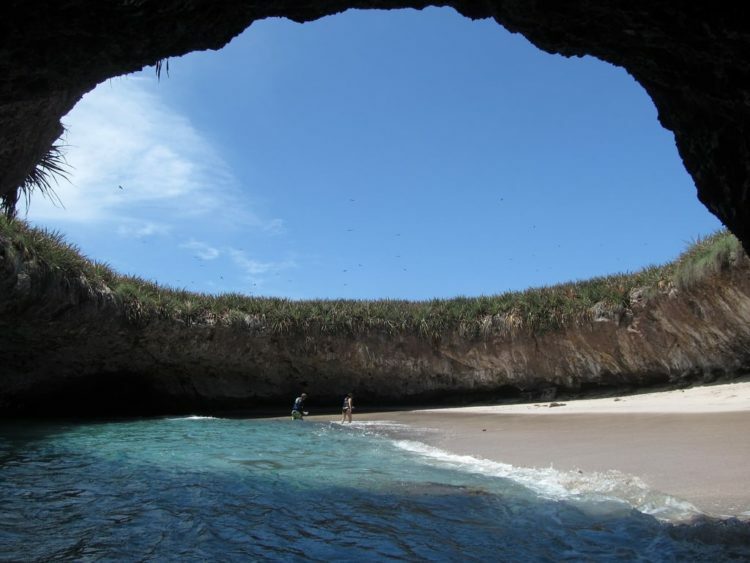 Making this experience even more dream-like is that you must swim through a tunnel to get to Hidden Beach, before the skies open up and you lie on the warm sands looking up through the hole to the sunshine streaming in and the birds soaring above. 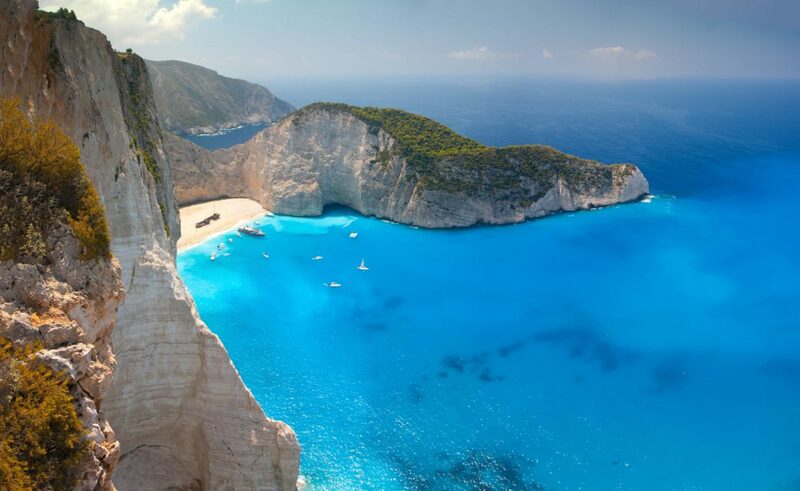 Explore a shipwreck beneath towering cliffs on Shipwreck Beach, Zakynthos, Greece. One of the most photographed beaches on earth, Shipwreck (Navagio) Beach is astonishing in its grandeur. A rusting smuggler’s ship sinks slowly into soft golden sands, dwarfed by the sheer limestone cliffs that curve around the beach, completely cutting it off from land access. You can only reach this awe-inspiring beach by boat, so drop anchor in the cobalt blue Mediterranean waters and take the tender ashore for a picnic you’ll never forget, or take a walk up to a nearby cliff-top and get the photo of a lifetime from above. 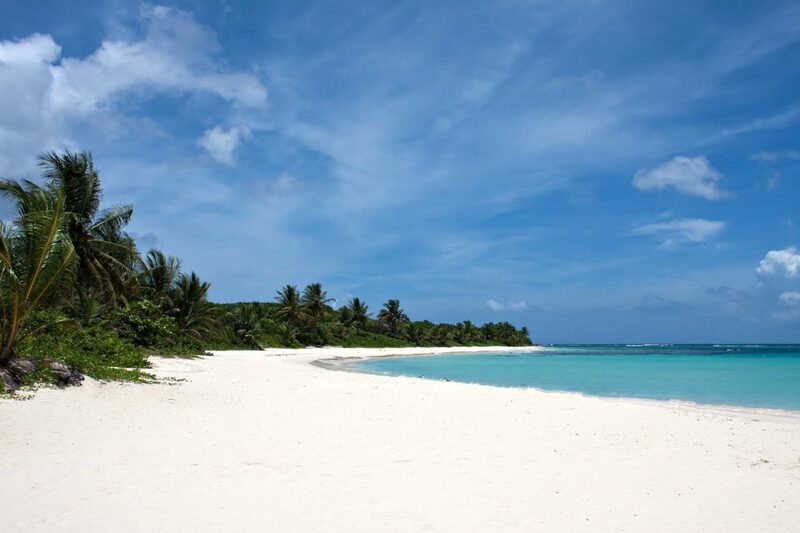 Discover tranquil beach paradise on the forgotten islands of Puerto Rico. Recently rebranded as ‘the Spanish Virgin Islands’, the Passage Islands of Puerto Rico were used for many years as a military training ground, creating a timeless paradise of deserted beaches and sleepy coastal villages. Playa de Flamenco is often voted among the best beach in the world, with sand so white it almost hurts the eyes and turquoise seas which lap up on the shore. There are remnants of the past here too: a military tank rusts on the water’s edge, its deep orange patina providing a stunning contrast between the green palm trees and the endless blue of sea and sky. As you float through the Spanish Virgin Islands on your yacht charter you’ll also come across the superb Vieques Bay, where dazzling bioluminescence lights up the sea at night like all the stars in the sky, and the almost painfully-pretty Bahia Tortuga, where blue- green rockpools bubble like Jacuzzis, and sea turtles float lazily through crystal clear seas. 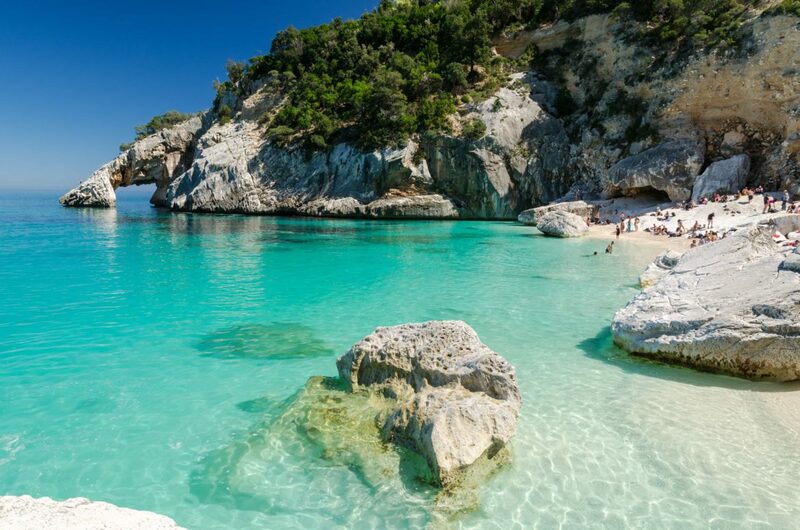 Float through crystalline seas along the sugar-white beaches of Sardinia. The task of picking one Sardinian beach that rises above all others is nigh impossible, for this enchanting Mediterranean island is simply littered with exquisite beaches—each one a candidate for the title of most beautiful beach in the world. The Costa Smerelda is a yachting playground, with yacht charters flocking to the emerald coast each year to enjoy the stunning beaches of Liscia Ruja, Romazzino, Spiaggia Pevero, Spiaggia del Principe and Capriccioli. Just offshore in the islands, you’ll find glimmering turquoise lagoons dotted with giant granite boulders on La Maddalena, while on Chia the rolling dunes and wildflower paths are the perfect place for a summery stroll by the sea. Swim in the shadow of mighty boulders and jungle palms at Anse Source d’Argent, Seychelles. When it comes to the Indian Ocean, the Maldives get a lot of attention for their perfect coral-atoll beaches, but the Seychelles have them soundly beaten when it comes to stunning beach backdrops. 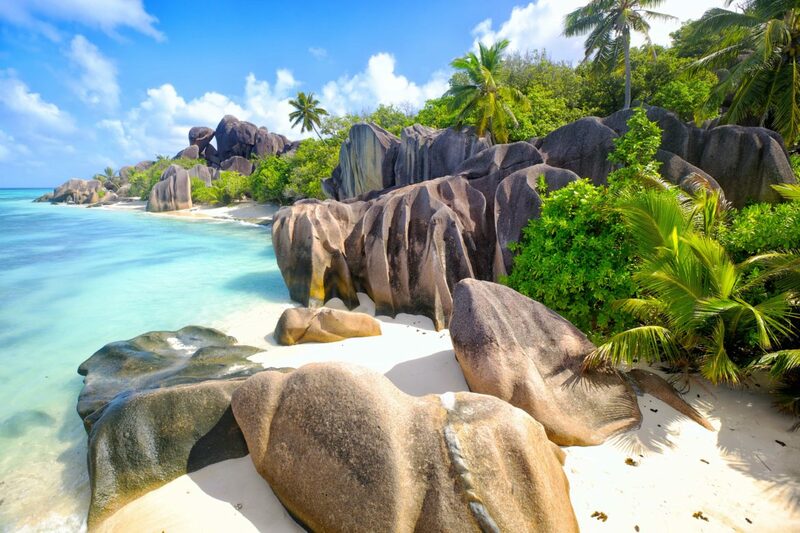 The Seychelles have some of the most magnificent rock formations to be found anywhere, with immense boulders that loom over perfect white sand beaches nestled on the edge of the African jungle. Of all the superb beaches of the Seychelles, Anse Source d’Argent (the ‘source of silver’) on La Digue island is the most wonderful of them all, with shallow water perfect for swimming and a landscape straight out of a dream. There is simply no better way to explore the world’s best beaches than by luxury yacht. Find your beach bliss on a superyacht vacation with OceanScape Yachts.